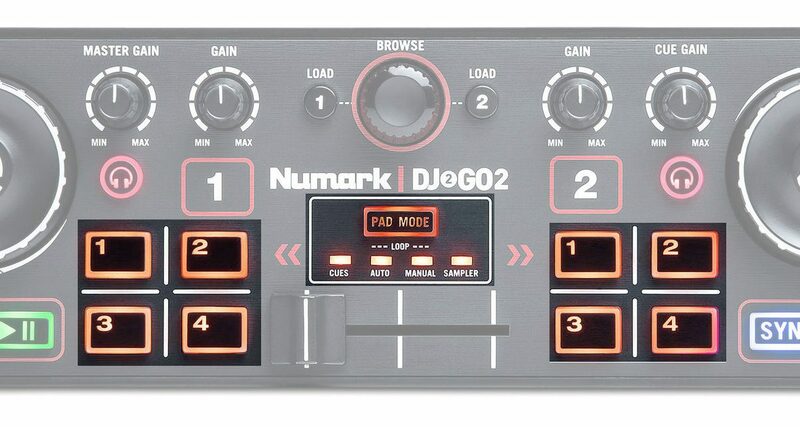 The Numark DJ2GO2 is a decent and affordable controller for beginners and pros who need a backup for gigs. Its tiny footprint means you can stash this in rucksack for DJing on the go – it’s even small enough to sit on top of your laptop. Lack of EQs and a jogwheel “scratch” feature rub half a star from its rating, but at this size and price, we really can’t complain. If you spin or want to spin with Serato DJ or Virtual DJ, go get it. This one’s going to be popular, for sure. It’s a tiny two-channel controller – small enough to sit on top of your laptop’s trackpad / wrist pad area. 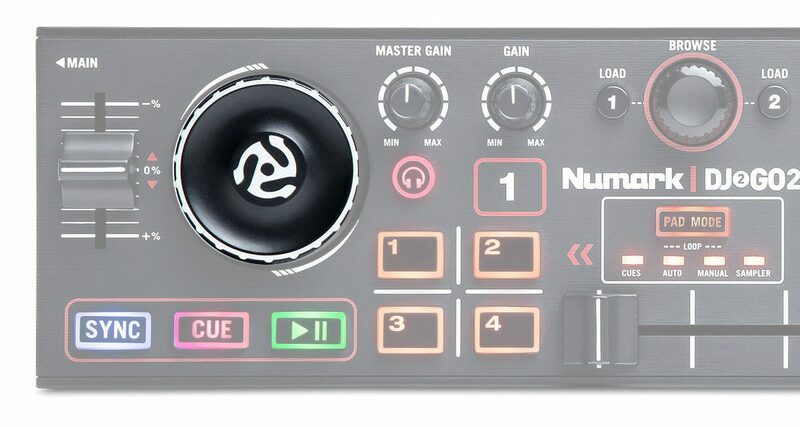 Each channel has a small jogwheel, sync, cue and play/pause buttons, a volume knob, a pitch fader for beatmatching, and four performance buttons with four selectable modes: Cues, Auto Loop, Manual Loop and Sampler. Other controls include a crossfader that sits in the middle of the unit, master and cue volume knobs, and a big browse knob with deck load buttons. Then and now: The DJ2GO (top) looks dated compared to the sleeker, more refined DJ2GO2 (bottom). It comes with its own sound card onboard: the sides have a 1/8″ master output jack, a 1/8″ headphone jack and a mini-USB jack. All leads come in the box. 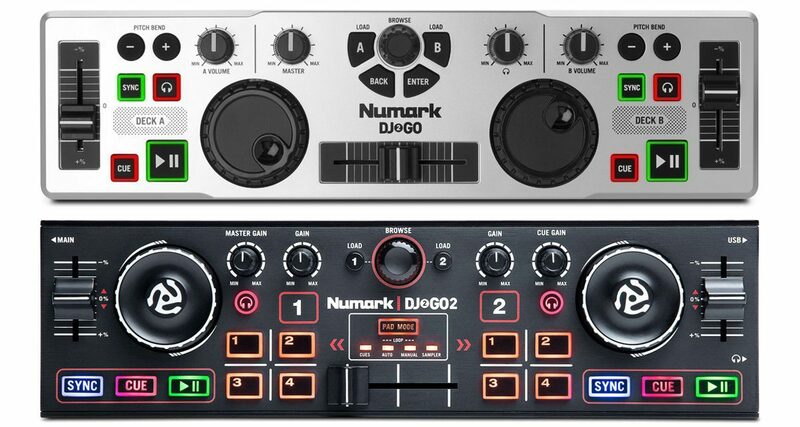 The Numark DJ2GO2 also ships with a copy of Serato DJ Intro, which is the “lite” version of Serato DJ. As of this writing, it also works with Virtual DJ 8. I plugged the DJ2GO2, fired up Serato DJ Intro and got to work. The DJ2GO2’s jogwheels are used for scrubbing through a track and for pitch bends during manual beatmatching. You may think you can scratch on it, but you can’t: It doesn’t have a “vinyl” or “scratch” mode, so that means that whenever you spin the jogs while a track is playing, you’re only able to speed up or slow down the track. Bit of a bummer for scratch DJs looking to get this for their set-up. That said, the jogs are responsive and useful when doing manual beatmixing, and you get used to their size quickly. There are four performance pad buttons per deck, and they have four pad modes: Cues let you set hot cues in Serato DJ, Auto and Manual loop let you set loop in and loop out points, and Sampler lets you trigger sounds from Serato DJ’s sample banks. They’re clicky buttons and not the soft rubber pads that tend to show up on DJ controllers these days. They’re fairly usable, just don’t expect to do any lighting-fast quick cue juggles or finger drumming here. There are short-throw pitch faders on the DJ2GO2, and that means you can perform beatmixes without reaching for the sync button. This is great news for DJs who would rather perform manual beatmatching, especially for beginners who would like to learn how to do so (which we always recommend). If you’re coming from full-size media players like CDJs or bigger controllers, the tiny jogs take some getting used to and you may find yourself overshooting your pitch bends, but you get used to it quickly. Without a doubt this is the strongest suit of the DJ2GO2. Its tiny footprint means you can take this anywhere with you, and I’ve done just that in my past Europe trip. I always travel with a laptop and headphones for work anyway, so I threw this in my DJ bag along with a Minirig Mini speaker. 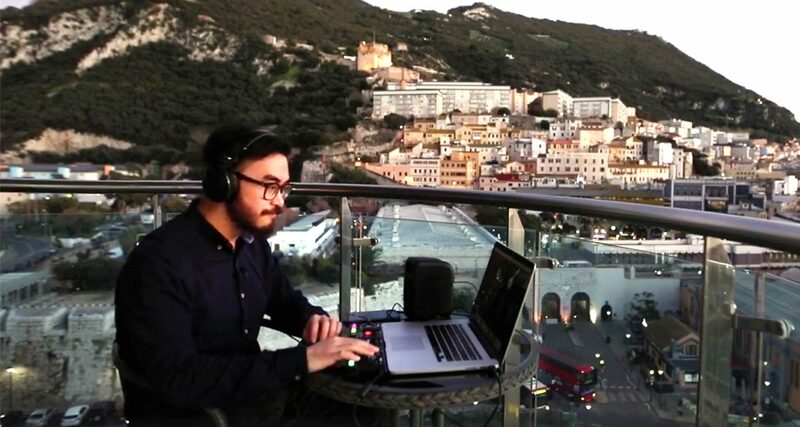 This combo let me spin in hotel balconies with awesome views (makes for great social media content) and even in airport departure gates for layovers that are the travelling DJ’s equivalent of watching paint dry. It’s for this reason that I think all DJs should have this – in my nine-day trip I was able to film, live stream, and record a month’s worth of DJ sets and performances. Not bad for a controller that probably costs less than a weekend out. 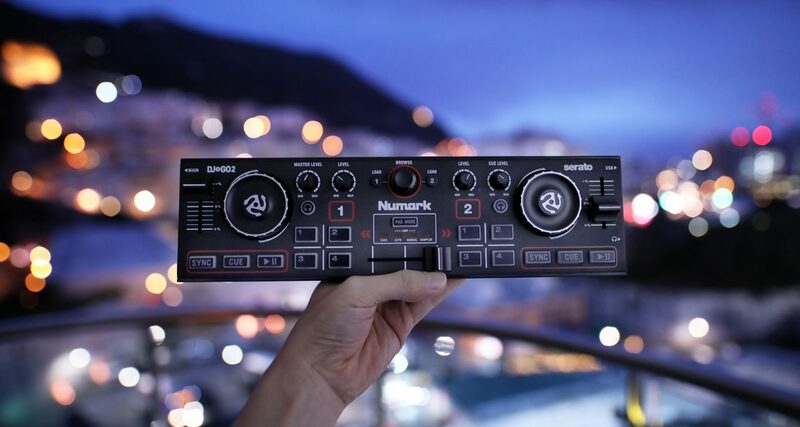 The Numark DJ2GO2 is the best portable controller you can buy at this price range. It’s small, it works with Serato DJ, and is dirt cheap. If you’re a beginner who wants to try DJing but you don’t have a lot of cash to spend, this is a solid starting point. If you’ve already got a DJ controller or you spin at clubs with media players but you’re looking for a backup device, this one fits the bill as well. The only downsides are the lack of EQs and jogwheel scratch mode, but again you’re getting so much for a small spend. Highly recommended. 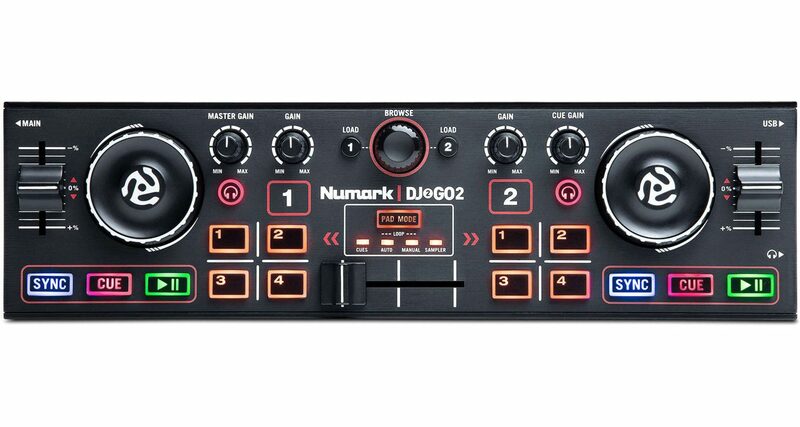 • Grab our intro course for the DJ2GO2 by clicking here. I love mine! Use it a coffee shops to analyze tracks and set cues, and on the plane to allow full access Serato. I don’t mind that it doesn’t have a vinyl and cant scratch, but REALLY wish it had a filter knob for each channel, or at least a low EQ. Surprised that either feature wasn’t mentioned in the review, it would make it a KILLER bit of kit with that addition. Thanks for the review Joey, great summary as always! ?? Looks like fun and certainly worth as a backup. Always worried when people place drinks near my decks. Couple of hacks: It fits in a Korg Nano series case which is about £15 on Amazon, and I’ve re-mapped the trims (which I never use) to be filter controls. If I could just have vinyl mode and +/- 4% pitch control it would be perfect. Had a play with this at Namm. It works well with VirtualDJ for sure. How much drain is it on your laptop’s battery with go2? A quick question; you’ve mentioned that the controller does not have vinyl mode, but if a track is paused, can you scrob back and forth using the jog wheel as you would when seeking a cue point as you would on normal controllers? Hey Jon, you need to pay for a separate Serato DJ licence is what I understand. I’ve also got all those expansions as well as existing Serato DJ licences, but when I plugged the DJ2GO2 in I still had to “activate” it, meaning I still had to buy! Not sure if it’s just me, but I can see some other folk online saying the same thing. Wanted to buy one while at the BPM show in October, thought I could wait til the second day. Bummer, sold out! Got one when I got back and played around with it. It’s all that Joey says. One of those no-brainer, keep in your bag at all times, kinda things. In the process of trying it, in combination with a camera connection kit, with software on my iPad. Heres a stupid question. If i have two, can i use both at the same time to control four deck in serato dj pro? Hi! I can use it with DJM-S9? As complement/backup, when i have a issue with my needles or control vinyls. It only has a single master out, so you can’t output two channels… it is therefore going to be both your decks and your mixer. But that said you can use it as a backup with Serato te replace your DJM-9/DVS set-up entirely. I have a djm s9 and two turntables, I want a controller with jogs, to switch my setup in internal mode when I have a issues with my control vinyl or needles. What about the sound quality of 2 outputs(main and headphones)…is it the same? Is there any way to map this so that I can use it to adjust my beat grid?